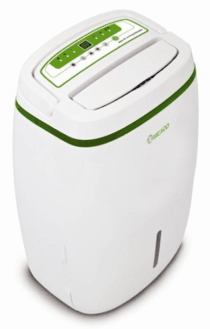 Meaco 20L Low Energy Review - Meaco's Best Dehumidifier? 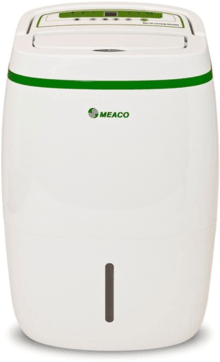 The Meaco 20L Low Energy dehumidifier is the pinnacle of Meaco’s sizable domestic range. Meaco also do another 20L dehumidifier (our review is here if you’re interested), but the low energy version runs at 255W rather than 355W. The ‘Low Energy’ 20L also has better features, including much greater control over the humidity and a rotating louvre/ air deflector. It also feels and looks more premium. The along with the 12L Low Energy model, the 20L Low Energy forms part of Meaco’s Platinum series of dehumidifiers, which seeks to bring consumers a greater level of quality than usually seen in the market. In an earlier review we were impressed with the 12L model and we’ve got a sneaking suspicion that the 20L Low Energy model is even better. We’ll find out in our Meaco 20L Low Energy Review below. Let’s start looking at the features by running through the excellent soft-touch control panel. I’ve lifted this picture straight from the instructions so that it’s easy to read. The first button selects between the two fan speeds. It’s very useful to have the flexibility of two independently selectable fan speeds. This is because different situations call for different approaches. Most of the time it makes sense to use the lower fan speed to save energy and to keep the noise down. However it’s handy to have the extra power of the higher fan speed when drying laundry, or if the humidity is particularly bad (e.g. someone has just stepped out of the shower), as this should increase the humidity extraction rate. Interestingly, the 12L Low Energy model only has one fan speed, so this is a big reason to opt for the 20L. The timer is another useful feature. For example, laundry should only take a couple of hours to dry, so if you’re not around to turn the machine off/down then using the timer will allow you to save energy. It’s also useful for those people who don’t like to leave their dehumidifier switched on all day. The timer function on this machine is better than on rival appliances because rather than having set options (e.g. 2, 4 and 8 hours) the number of hours is set via the LCD display. To set the timer simply press the timer button and use the up/ down keys to select the number of hours you’d like to set the timer for. When not being used for the timer, the up/ down keys in the middle of the control panel dictate the desired humidity level of the home. There’s a selectable range from 30% to 80% relative humidity in 5%RH steps. This gives the user a much wider choice than on many rival machines that typically have just three levels to choose between. We’d recommend that you choose about 55%RH for most days, maybe dropping it down to 45%RH on very cold days (this should stop condensation forming). For drying laundry there isn’t a specific ‘laundry mode’ as such, but you can achieve the same conditions with this machine by selecting either 30%RH or continuous operation (CO) and the higher of the two fan speeds. The big difference to remember between Meaco dehumidifiers and their competitors is the so-called ‘Meaco control logic’. In simple terms, Meaco dehumidifiers switch their fans off when they’re not dehumidifying (i.e. after the desired humidity has been reached). This sounds obvious, but every other dehumidifier that we know of keeps their fans running continuously. A Meaco dehumidifier switches the fans back on every 30 minutes to check the humidity of the room. If at this point the humidity has risen beyond the desired level then it will start dehumidifying again. If the humidity is OK at this point then it will go back to sleep for another 30 minutes. A further potentially useful feature to note is that a child lock function can be activated by pressing and holding the up and down arrows for two seconds. The next button controls the motorised louvre. Switching this on will see the air deflector move continuously through roughly 90°, which will ensure better air distribution. Very few dehumidifiers have such a feature at the moment and this is one of the plus points of going for the 20L rather than 12L Low Energy model, which has only a manually adjustable louvre. When the 20L Low Energy is switched on the one droplet light will illuminate to indicate that the appliance is dehumidifying. When this light begins to flash then it indicates that the machine is in defrost mode. This occurs with increasing frequency as the room temperature drops below 16°C. Switching into this mode ensures that the refrigerant coils stay free of frost and thereby maintain their efficiency. Thankfully this mode uses precious little energy (~30W). The final thing of note on the control panel is the bucket full light. No surprises here, it lights up when the enormous six litre water collection bucket is full. The water collection bucket is by far the biggest seen among the major dehumidifier brands. Obviously this will greatly reduce the number of times you’ll be required to empty it. The bucket is really well designed, with a decent handle on the top of it, a lid to minimise the potential for spillages and a viewing window on the front to easily see how much water has been collected at any one time. On the back of the unit there’s a connection for a 14mm pipe should you wish to use the continuous drainage option. The Meaco 20L Low Energy dehumidifier is mounted on so-called ‘easy glide’ castor wheels that are somewhat hidden under the skirt of the bodywork. These are very handy as the machine in no lightweight, tipping the scales at 12.6kg. However, this is still lighter than many of the other machines in its extraction class. Lifting the machine up is made easier by a chunky top-mounted carry handle, which folds neatly around the control panel when it’s not required. The appliance measures 38.5cm wide by 59.5cm tall by 29cm deep, which does mean that it’s one of the largest dehumidifiers on the market. Having said that, if you’re upgrading from a older dehumidifier, you’ll likely be shocked by how much smaller they are these days. In our opinion this dehumidifier is the best-looking machine that Meaco produce. It has a modern, minimalist design and with the curved sides looks almost like an egg. The green band matches the control panel and ensures that it doesn’t look too bland. From a practical perspective the 20L Low Energy also excels. 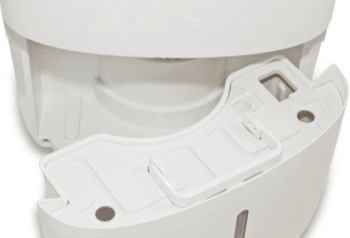 For example, the water collection bucket is front-mounted, which is great to see as it makes checking and emptying the bucket much easier. Strangely, this is the only model that Meaco produce that has a water collection tank accessible from the front. A powerful 20L refrigerant dehumidifier is never going to be the quietest, but this model certainly doesn’t let itself down in this area. Meaco state that the appliance produces a maximum of 46dB, which is respectable, particularly as this is measured at maximum extraction rate on the higher of the two fan speeds. On the lower of the two fan speeds it’s quiet and those people not sensitive about noise could even keep this in the living room or bedroom. This is a brute of a dehumidifier, practically ripping moisture from the air. Meaco models are known for excellent extraction performance under standard UK conditions rather than in labs and the same holds true here. While 20L of extracted water shouldn’t be your daily expectation (this was measured at 30°C and 80%RH), it shouldn’t take more than a couple of days to fill the water collection bucket, provided your house is suffering from humidity. 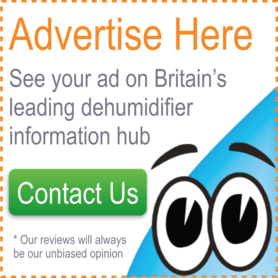 This is easily one of the most powerful domestic dehumidifiers on the market and given its low energy credentials, I’d hazard a guess that it’s the most efficient per litre of water extracted too. 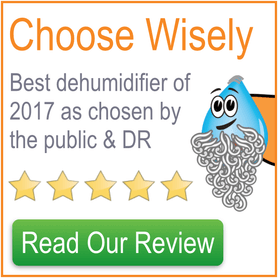 In our opinion this is by far the best dehumidifier that Meaco produce, which is impressive given that their other models certainly aren’t bad. Which? agree with us and goes further, making it their ‘Best Buy’ for 2014. While the Meaco 20L Low Energy lacks some air purification gizmos, it offers fantastic extraction performance in a well-designed package for very small energy costs. Check out the price at this store and the machine should pay for itself through energy savings in roughly 2-3 years.